Diets make you fat. Eating makes you skinny. 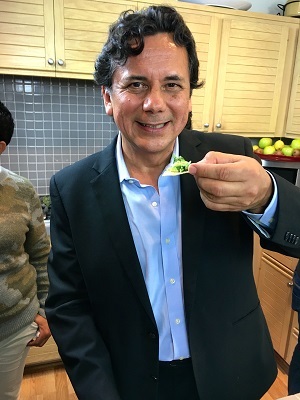 Dr. Rafael Bolio, a foremost expert on nutrition in Mexico City for over 20 years, now resides in in Southern California. He has discovered how to pinpoint weight loss in “only” desired areas WITHOUT AFFECTING the rest of the body. The problem with most weight loss programs is that people lose everything from head to toes when they really want to reduce only certain area. This is a major problem because most women won’t want to lose their firm breast and neither men nor women want to lose tight glutes (the muscles of the buttocks). Dr. Bolio is the only nutrition expert in the world that can perform this task without the use of supplements, exercise, or surgery, with only a meal plan that affects the desired area. He calls this “smart nutrition” because he only focuses on the body parts that need reduction. It is well known today that you can REDUCE WAISTLINE with a balanced diet, but Dr. Bolio can reduce inches in any part of the body by providing the right meal combinations. “I use nutrition to change bodies, I target fat lost, but am not a nutritionist, as we know them, I am a Doctor that uses Smart Nutrition,” commented Dr. Bolio. He has been performing this program for over 20 years; this is why he is known as the “Celebrity Nutritionist” in Mexico helping hundreds of celebrities and movie stars to achieve spectacular figures. Among the best-known Mexican superstars were; Thalia, Angelica Vale, Kate del Castillo, Angelica Maria, Galilea Montijo just to name a few. Dr. Bolio discovered mathematical equations that target specific parts of the body. He found an equation for abdominal fat, another for fat around the glutes and thighs, and another for thoracic fat. Dr. Bolio states “I did not create these formulas, they have been shaping our body for thousands of years. All I did was systematize the changes that I observed on thousands of naked patients”. As a specialist in Internal Medicine and Critical Care Medicine, he used his knowledge to discover the right way to battle obesity. He developed a system that also helps reduce or control stress, diabetes, cholesterol, triglycerides, high blood pressure, rheumatoid arthritis, migraine, asthma, as well as many others ailments. Other benefits of the system are enhanced intellectual performance, improved sleeping habits, more youthful skin, increased hair growth, increased sexual performance and increased fertility. His program not only protects facial expressions, he even created programs that make people look 10 to 20 years younger! Both beauty and health through his scientific programs are now available to anyone around the world on this Web page. In 1980, Dr. Bolio began obesity treatment with an original pharmacological protocol, using the same principles that 15 years later other investigators applied in the phentermine-fenfluramine procedure. After numerous failures with traditional weight loss diets, he decided to create a counter-intuitive approach with an entirely different thesis. He decided to give his patients MORE FOOD INSTEAD OF LESS. In 1985, he established the theory that the main causes of weight gain were under-nutrition/ malnutrition, and began treating his patients with a non-calorie restricted program. What is also amazing about his weight reduction program is that it will make you eat more rather than less to lose weight and shape your body, and therefore never be hungry. In 1990, he was invited to lead a national task force to treat obesity. In 1994, he published his findings in his “bestseller book” DIETS MAKE YOU FAT EATING MAKES YOU SKINNY which remained the most sold book in Mexico for years, selling more than a million copies. This book is currently used in Schools of Nutrition across the nation when their students learn of obesity treatments. In 1996, Dr. Bolio was invited to a national debate ordered by the Secretary of Health to establish the nutritional guidelines for the country. They accepted Dr. Bolio’s recommendations as the most feasible. In 1998, the Mexican Government named a panel of experts which included Dr. Bolio to establish the legal criteria for medical obesity treatment. The following year the Mexican Board of Internal Medicine, one of the most prestigious agencies in the area of health acknowledged Dr. Bolio for his expertise, findings, and recommendations. To this date, Mexico is the only government to address volume more than weight, and nutrition more than restrictions. At the age of 17, he attended the School of Medicine at the National Autonomous University of Mexico, graduating in 1977. He specialized in Internal Medicine at the Medical Center La Raza in Mexico City. At age 30, he became the youngest Chief of Staff of Intensive Care Ward in the country, and two years later the Mexican Institute of Social Security recognized him as “Doctor of the Year” for his excellent work in creating and organizing this Ward.